Although I have not found it a particularly fruitful year for collecting shieldbug and other hemiptera records, there have been some interesting developments. The Bishop’s Mitre Aelia acuminata which was first recorded in Redditch in 2001 now appears to be well established in the county, with some undisturbed grassy areas producing three or four specimens for each use of the sweep net. Unfortunately, its cryptic colouring means that it is unlikely to be seen just by looking, although I did come across one pair in the top of a thistle. 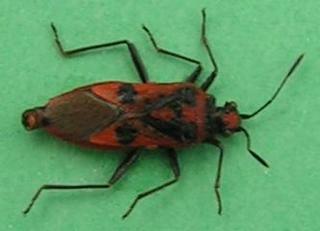 There have been three records so far this year for the red and black bug Corizus hyoscyami, for which the popularising authors do not seem to have invented an English name. These records are from Gary Farmer, John Meiklejohn and Margaret Collier. 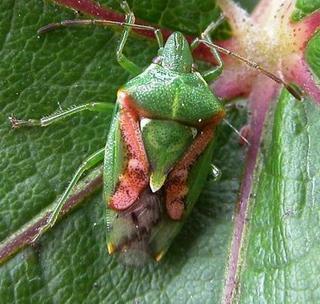 This species has been previously known from coastal sites in south-west England and Wales (source: Shieldbugs of Surrey). 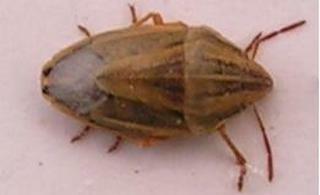 The bright colouring of this bug should ensure that we get more records if it persists in the area. On a visit to Bodenham Arboretum with the Redditch group in October, I found a Blue Shieldbug, Zicrona caerulea, in dead vegetation on the edge of the lake – a fairly typical habitat since they like damp places. This was the first record for this year. Lastly, I have found a specimen of Eurygaster testudinaria at St. Kenelm’s Church near Clent, with the only previous record being from 1985 by John Meiklejohn at Defford. 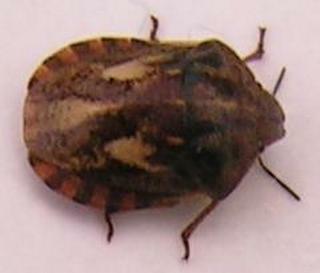 Patterned in shades of beige, it bears a slight resemblance to a tortoise, and has been called a tortoise bug. In May 2005, I found a single Juniper Shieldbug on a scabious plant in my Stourbridge(VC37) garden. Although this was the first record for this garden, I’d expected to see this species as the neighbours have some large and mature Lawson’s Cypress. Sadly they’re not easily accessible, so I haven’t been able to check whether population levels are constant, or do fluctuate. In the 1980s, I remember seeing several clusters of the bugs on the golden form of Lawson’s Cypress in my parents’ garden at West Hagley. There were a few groups of a dozen or so bugs and their colouring was duller than ones I have seen since, suggesting that the time of year was autumn or early spring.